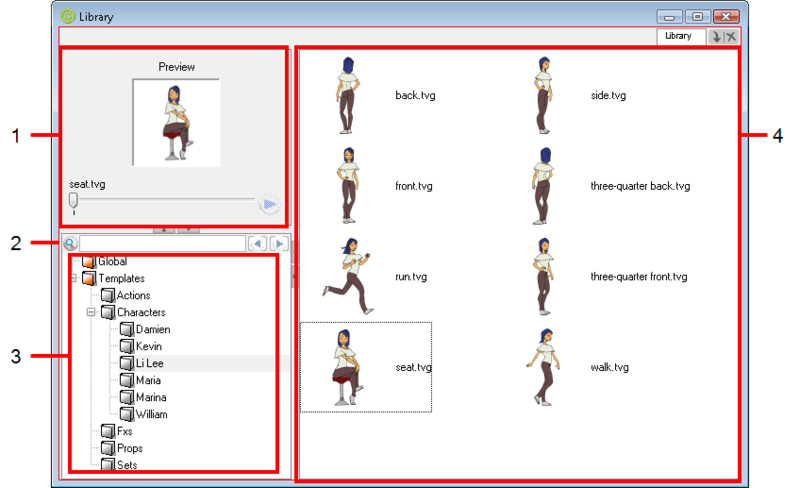 The Library view is used to create and manage templates, as well as the folders containing them. ‣ Select Windows > Library. 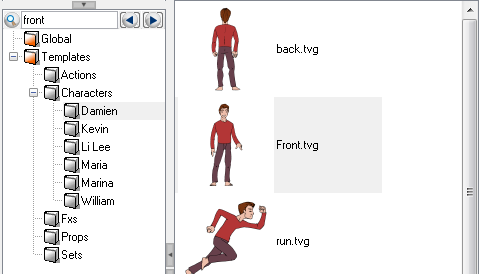 The library`s preview window lets you preview the contents of a template. 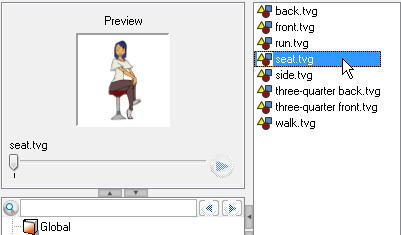 NOTE: Audio files cannot be previewed in the preview section of the library window. Click the down arrow button above the Quick Search section to expand the preview section. Double-click the template you want to preview from the template list. You can also right-click the selected template and select Preview Template. You can also double-click a template from the template list while the preview section is collapsed to expand the preview section and preview the selected template at once. ‣ When you created a template out of a panel containing a layer motion, click the Play button or drag the slider to scrub through the panel. ‣ When you created a template out of a sound, click the Play button to play back the sound. You can use the Quick Search field to rapidly locate a particular template using a keyword contained in the template’s name. In the Quick Search field, type a word or part of a word contained in the template’s name. You can select a folder in the Library’s List to limit the search to this specific library. The first template found with the keyword you used is being selected and displayed in the right side of the Library view along with the other templates contained in the same folder. Click the Right Arrow button to find the next template containing the keyword, or on the Left Arrow button to see the previous result. The Library List is used to navigate through the different libraries and subfolders. You can also open, close and create new libraries from here. • Global: This is an empty folder you can use to organize your templates. This library is automatically shared between different projects. You can organize this library folder using subfolders. When you save items in the Global library, it is saved by default to a location in your Documents folder on your machine. • Templates: This folder contains default templates provided with Storyboard Pro and is stored on your hard drive. The content of this Library is automatically shared between the different projects. 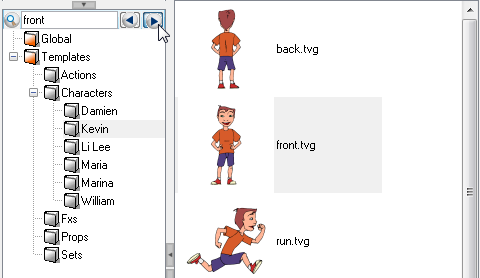 The templates contained in the selected Library list can be displayed on the right side of the Library view as thumbnails, in a list or as details. ‣ In the Library view’s right side, right-click and select View > List, Thumbnails or Details.